Version for Viola Revised Edition. Composed by Johannes Brahms (1833-1897). Edited by Egon Voss and Johannes Behr. Arranged by Klaus Schilde and Tabea Zimmermann. Sheet music. Henle Music Folios. Classical. Softcover. 108 pages. G. Henle #HN988. Published by G. Henle (HL.51480988). 12x9.25 inches. Eds. Johannes Behr, Egon Voss; fing. : Klaus Schilde; fing. Va.: Tabea Zimmermann. We owe a debt of gratitude to the clarinettist Richard Mühlfeld for making the elderly Brahms so interested in his instrument. In the 1890s the composer wrote the Trio op. 114, the Quintet op. 115 and the Sonatas op. 120 – three gems in the clarinet chamber music repertoire. Brahms also provided a part for viola as an alternative to the clarinet. 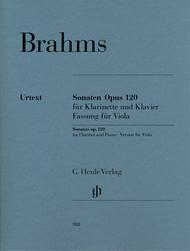 The revision of our edition of the viola version of opus 120 is based on the musical text of the New Brahms Complete Edition and in many respects contains significant improvements: we were able to consult the autograph for the first time; the newly set piano score now contains the viola part; and viola players can benefit from fingerings and bowings by Tabea Zimmermann in the solo part. Includes marked and unmarked string parts.